If you're anything like me (forgetful) you may have tried LUSH's face masks in the past, used them once, placed them into your fridge, to consequently be forgotten about. But hold up, did you know LUSH sell self-preserving a.k.a no fridge required face masks? No? Me neither until a fellow beauty blogger tweeted me telling me otherwise. 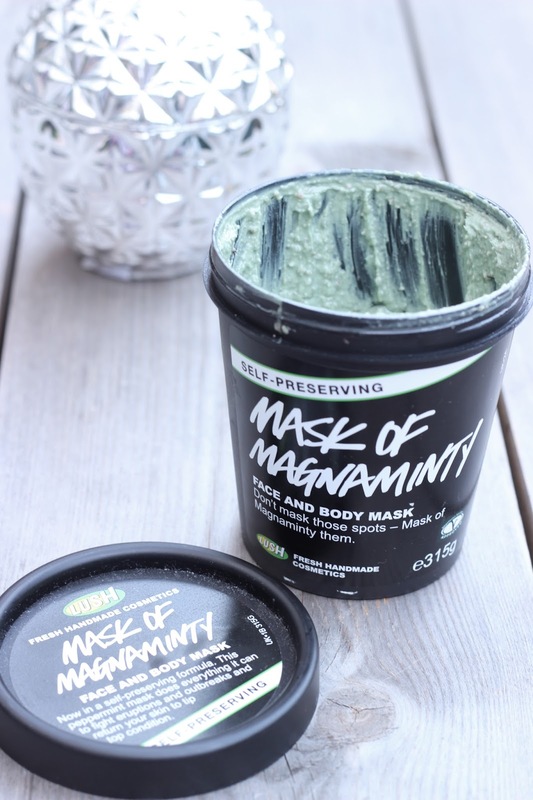 LUSH Mask Of Magnaminty has an expiry date of 3 months, is targeted towards those with breakout/blemish prone skin and can be used on both the face and body. The green mask, not only smells seriously minty, but looks a little like mint choc chip ice-cream in a very appropriate ice-creamesque tub. It's thick and a little gloopy and on application is feels cooling on the skin. LUSH Mask Of Magnaminty includes fourteen ingredients, thirteen of which are natural including; honey a natural antiseptic, peppermint oil which helps to absorb excess oil and aduki beans which gently exfoliate the skin. I personally like to cleanse, then apply a generous layer onto my skin, relax for all of 10 minutes and Snapchat my mask smothered face to a few of my friends (as you do) whilst it works its magic. Once the 10 minutes are up, it's ready to be washed away and unlike your traditional green minty mask, it doesn't harden on the skin and is relatively mess free to remove. After my skin instantly looks calmer and my blemishes and active breakouts are noticeably reduced and soothed. You'll be happy to hear it's not drying, I'm never in any rush to apply moisturiser after. And not only does it leave my blemish prone skin happier, my skin feels soft and appears to glow. Overall, LUSH's Mask Of Magnaminty is a hit. Not only does it work, it costs just £9.95. It's also a great natural alternative to Peter Thomas Roth's Pumpkin Enzyme Mask. You can buy it online at LUSH here.